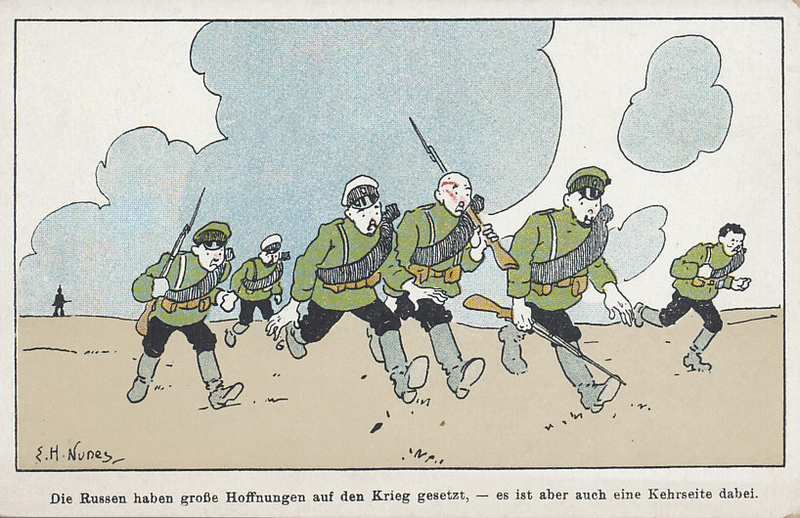 Russian troops fleeing a solitary German soldier. The Russian First Army invaded Germany in August 1914, and defeated the Germans in the Battle of Gumbinnen on the 20th. In September the Germans drove them out of Russia in the First Battle of the Masurian Lakes. In September and October, a joint German, Austro-Hungarian offensive drove the Russians back almost to Warsaw. Illustration by E. H. Nunes. Die Russen haben große Hoffnungen auf den Krieg gesetzt, - es ist aber auch eine Kehrseite dabei. The Russians have set high hopes for the war - but there is also a downside to that. Defeated in Russo-Japanese war of 1905, Russia had 1,300,000 men on its borders with Germany and Austria-Hungary on the eve of war in 1914. It also had 4,000,000 reserves. The army was under-equipped, and fielded infantrymen with no rifles. It suffered from inadequate munitions. Its rail lines to Germany from Russian Poland were intentionally poor to minimize the chance of Germany making use of them for an invasion. In 1914, armies facing Germany and Austria-Hungary for organized into two army groups. The First and Second Armies under Generals von Rennenkampf and Samsanov respectively comprised the Northwest Group under Zhilinsky. 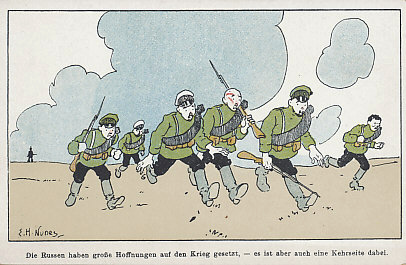 Four Russian armies comprised the Southwest Group facing Austria-Hungary. The Caucasus Army faced Turkey along the countries' common border. Grand Duke Nicholas commanded the Army until September 5, 1915, when the Tsar took command because of the Army's continuing retreat in the face of the Gorlice-Tarnow Offensive. The Russians suffered two million casualties during 1915. By 1916, the Army Groups had been reorganized into three group: North (Kuropotkin), West (Ewarth), and Southwest (Brusilov). Brusilov's Offensive in June, 1916, was the Imperial Army's last major offensive.